ACT 6: CREDIT WHERE CREDITS ARE DUE...! Where and when... meet Mr A, see a performance! 'Happy Birthday' to the circus - Britain’s first-ever permanent marker of a pivotal moment in popular culture. The commemorative plaque in Cornwall Rd SE1 8TW, funded and erected by the Lambeth Estate Residents' Association, unveiled by Chris Barltrop on Easter Monday 2018. Actor Chris Barltrop became a circus ringmaster in 1976. Now, as part of this year’s celebrations of the 250th birthday of the world’s first modern circus back in 1768, he's donned the guise of the 'father' of the modern circus, Serjeant-Major Philip Astley, to assist in a long-overdue celebration on the very spot and the very anniversary of those initial performances. ‘Like many important pieces of history, the true story of that first show and the early years of the circus arts has got blurred into myth’, said Barltrop. ‘Astley didn’t invent the circus, but he was an instinctive and larger-than-life showman who fostered its birth and its evolution from the displays of trick-riding he gave with his wife in Lambeth into an international art-form incorporating comedy, acrobatics, and feats of strength and physical skill. ‘Since I joined my first circus all that time ago’ explains the actor and writer ‘I’ve spent a lot of my spare time researching Astley’s story – how he performed to passers-by in a roped-off circular arena on an open field in Lambeth; how he began to include other performers and then took his new show to Ireland, to Vienna and Brussels, and also to France where his troupe performed for Marie-Antoinette and Louis XVI. 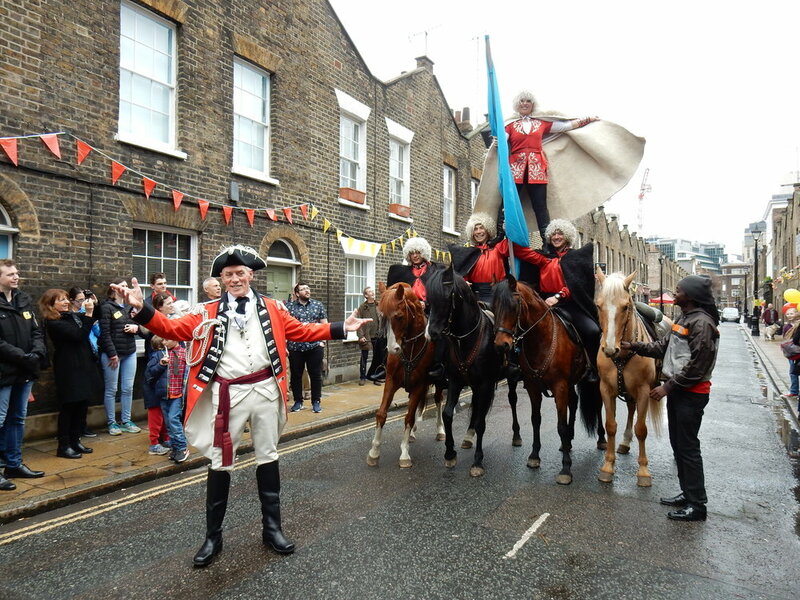 On Easter Monday 2018, 250 years to the day since Astley's first performances at a field in Lambeth known as Ha'penny (= Halfpenny) Hatch, Barltrop unveiled a commemorative plaque funded and erected by the area's #Lambeth Estate Residents' Association - the country’s first-ever permanent commemorative marker of Philip and Patty Astley’s initiative. That afternoon at the nearby @WaterlooEast Theatre, he premiered a carefully-researched one-man play telling the story. To impersonate Philip Astley, he was dressed in an authentic replica of the military costume worn by the founding father of circus. And points out Chris, 'Astley was the initiator, but he wasn't the sole contributor. Astley’s wife rode with him, beat a drum to draw the crowds, and took the entrance money. She was Patty Jones, and I'm keen to highlight her important role as a very active and hard-working partner'. And also the role of a third participant. Gibraltar was the horse given to Astley by his former commander in the Light Horse when Colonel Eliott was made Baron Heathfield of Gibraltar after a distinguished and heroic career. Horse and man were working partners for decades; his trusted equine companion was part of Astley’s success, and almost as famous as the man himself. * This proposition was put forward by Andrew Van Buren of Newcastle-Under-Lyme, Astley’s birthplace. Easter Monday 2018. Roupell St, Waterloo - the site of Astley’s Ha’penny Hatch. Chris Barltrop as Philip Astley, accompanied by the Khadikov Riders from Zippo’s Circus. The Amphitheatre commemorated at last! Follow the circus...keep in touch!